On Holy Wednesday, the Municipal Choir gives a concert of religious music at the Municipal Theatre, counter-weighing the philharmonic orchestra with polyphonic rather than Byzantine chants. Good Friday is probably the most special day of the Holy Week. The procession of the Epitaph begins at noon with the Epitaph of Panagia Spiliotissa at the New Fortress and the Pantokrator at Kampielo. 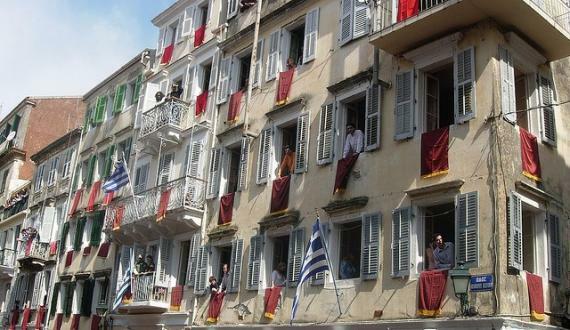 On the same day, the procession of the epitaph of the Catholic Diocese takes place, as Easter in Corfu is synchronized for Catholics and Orthodox. The most solemn moment of the Holy Week, however, is when the Epitaph of Metropolis is taken from the cave. The Epitaph is accompanied by three philharmonic orchestras, the choir of the Cathedral, secondary and high school children, scouts and the Red Cross with the philharmonic orchestras playing some of the greatest pieces of world music.